There are just two days left of the 2017-2018 school year and we're finishing strong. Check out these stories of the amazing things our staff and students are doing in the final days of school. Look for even more stories, photos and videos on Facebook.com/Stillwater834. Three Stillwater students attended the International Science and Engineering Fair in Los Angeles. Stillwater Junior High ninth grader Hannah Farmer and Stillwater Area High School tenth grader Everett Kroll were among just 1,800 students from 80 countries selected to present their projects for the prestigious competition. Tenth grader Haley Jostes attended as an observer. Kroll won a special $2,000 award from USAID for his has developed a low-cost prosthetic using the school's 3D printers funded by The Partnership Plan. Watch the WCCO-TV story. Oak-Land Junior High Principal Andy Fields has been selected as the Capitol Division Middle School Principal of the Year. SAHS speech coach Laura Hammond was named Section 4AA Coach of the Year by the Minnesota Speech Coaches Association. The class of 2017 will be graduating on Saturday, June 3. This year marks the 141st commencement exercise for Stillwater Area High School. The ceremony will be held at Roy Wilkins Auditorium in St. Paul. Watch it live online. Be sure to check out our custom Snapchat filter if you are there! Special graduation ceremonies for preschool, fifth and sixth grade, and some Special Education students are also taking place across the district in the final days of the year. You can look for a variety of graduation photos and videos at facebook.com/Stillwater834. This year our Pony family will say goodbye to 35 long-time employees. We wish them the best in their retirement and thank them for their dedicated service to our school community. See the full list of retirees. While Stillwater Area High School may look large from the outside, teachers and staff are making the school feel small and welcoming on the inside. Staff will be connecting with students from the first day of school though the last day using a research-based approach called BARR (Building Assets, Reducing Risks). BARR helps educators better connect with their students and address the issues that cause students to fail courses, dropout, and/or engage in harmful behavior. The result: significant improvements in course credits earned and grade point averages, and decreases in failure rates and absenteeism. Read more. Kids eat free all summer long! 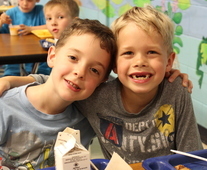 Stillwater Area Public Schools will be offering free breakfast and lunch to area children (2 to 18 years old) again this summer, thanks to a special program provided by federal funding. The goal of this program is to make sure all youth in our community have access to nutritious meals while school is out for the summer. Meals will be served at Oak-Land Middle School and Oak Park and Andersen elementaries. See menus, date and times online. This year's Distinguished Alumni will be honored at a special banquet on June 2 that is open to the public. Hear personal stories and memories from Marilyn “Lynn” (Bruette) Abercrombie, Class of 1948; Denis McDonough, Class of 1988; and Lee Valsvik, Class of 1978. Tickets are available on The Partnership Plan website. The school board will hold a closed session June 1 to discuss pending litigation. See the official notice. The school board will hold a closed meeting on July 13 for the purpose of superintendent evaluation. See the official notice.